Fall is usually one of my favorite times of the year. Not this year. Mainly because I need some SUNSHINE and I am not ready for winter...and in Idaho Falls, fall usually only lasts 3-4 days before winter hits HARD! But I am trying to embrace it as well as I can. Leaves are a pain to rake and get rid of, but I always love the jumping in them activity. 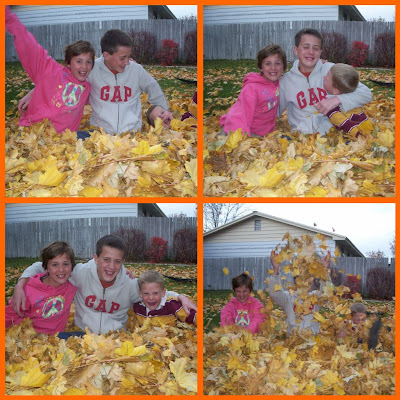 The kids had so much fun this afternoon while they were playing in the leaves. Jeffs Birthday is October 28th. Last year was his 40th and I did a huge party/movie for him http://nelsonhappenings2.blogspot.com/2008/11/happy-40th-jeff.html, so this year was mild compared to that, but we still went to his moms and she cooked him dinner and we sang to him while Calli accompanied us on her guitar. Happy Birthday Jeff!!! Hope you had a good one!? I am not in the "celebrating" mood right now. However, as a mom, you need to go through the motions for your kids because you may have a lot more Halloweens left, or you feel like you have lived your Halloweens already, but your kids are only going to have this year ONCE and so it is my job to just keep on going whether I feel like it or not. The kids are getting so much older and I realize that Halloween will soon become another reason for them to hang out with their friends and maybe wear questionable costumes to a party, or just be too cool to participate period. I tried to embrace Halloween this year for all of those reasons. We didn't do much. The kids picked out their costumes one night and I am always curious about the costume choices. Especially Calli. Never has she been anything "girly". This year it was a gangster! Okay? It was totally her and cute anyway. Mack was a ninja. Quentin has been a little cool for Halloween for a couple of years now but he still went out with Jeff and the kids to participate by helping them eat a few pieces of candy...Jeff had a lot of fun taking the kids out with a couple of other families. Mack pooped out a little early and so Jeff and Calli went around to quite a few more places before they came home, emptied her bag and then went around to a few more streets in my moms neighborhood before they were finally done. It was fun to have him do that with her. I'm with you - not in too much of a celebrating mood. Mostly because I am lazy, but it's true that they only get one Halloween, Birthday, Christmas, etc each year. I can't imagine losing one of them and thinking "I should have let her have a birthday party last year" or something like that. Each day is a blessing - please call and remind me of that!!!!!!!!!!! I love the pics of your kids in the leaves. I'm not a big Halloween person either but I still enjoy snitching a piece of candy or two. Now who wants to give mom a Butterfinger? Hey, you are an amazing mother, don't even think otherwise! I love the picture of the boys blowing out the candles....was it safe to eat afterwards? I also need to remember to enjoy the events...they won't last forever. Fun fall leaf pictures!! There is a great book called Mother's Book of Secrets by Linda Eyre and her daughter Shawni. There is a funny part about Halloween going along with your feelings. I'll find it and email it to ya. Happy Birthday, Jeff!